Harvard Medical School Assistant Professor Lisa Albers Prock spoke yesterday about pediatrics and the impact of neglect and adoption on children. 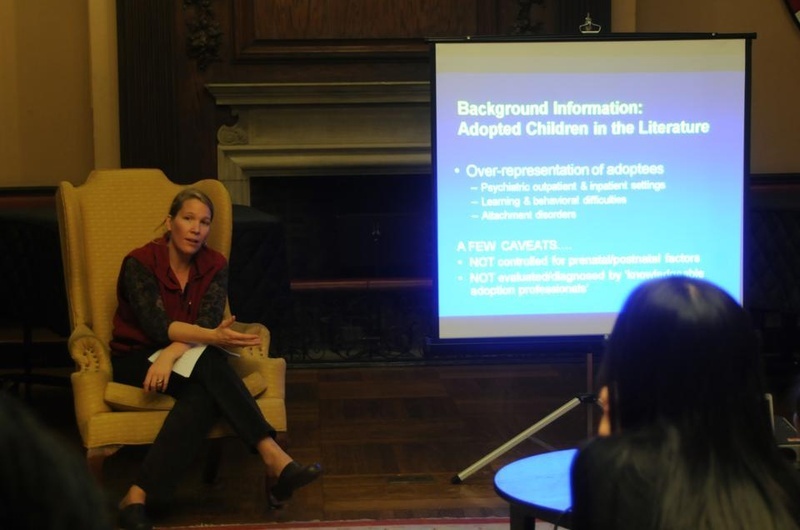 Speaking at an event organized by Harvard China Care, a student organization dedicated to improving the lives of abandoned and orphaned children in China, Prock discussed a variety of issues concerning the adoption of Chinese-born children by American families. Issues included psychological concerns facing both parties and unfavorable conditions in orphanages and foster care institutions. “Being with an adoptive family that is able to provide emotional support is much better than being in an orphanage with very limited one-on-one attention,” said Prock, an attending physician at the Children’s Hospital in Boston. Prock, an expert in developmental behavioral pediatrics who has traveled the world to examine the global adoption process, drew from anecdotal observations and specific case studies to call attention to the developmental considerations and emotional trajectory of adopted persons. To improve the experiences of internationally and interracially adopted children, Prock highlighted the importance of sufficient preparations by the adoptive parents and their extended family prior to the adoption, as well as open discussion in the post-adoptive environment. Of the small group of attendees, several had personal experiences with adoption. “Growing up, two of my closest friends were adopted, so it’s interesting to explore the psychology behind adoption,” said Rose Bamfo ’13. Responding to Prock’s concern about the rampant abandonment of children in rural China, Boston College freshman Matthew Alonsozana, who also attended the event, called on the Chinese government to take action. “Taking care of children is something China will have to improve on in order to show its commitment to social welfare,” he said. Prock concluded the talk by reaffirming her belief in the capability of adoptive families to adequately provide for the development of children. A couple of years ago, we were saints--now we are evil. Americans have been adopting Vietnamese children quietly for years. The committee’s proposal comes as a much-needed administrative response to the debate on academic culture.